Just about every other year in anticipation of the next latest and greatest entry into the main series of Pokemon RPGs, the internet is abuzz with “leaks” and rumours around what to expect from one of gaming’s best loved franchises. The buzz, eventually, becomes a deafening roar, as people clamour for information about the next Pokemon game. This year is special - Pokemon is coming to the Switch, with a vague release date set as “2018 or later” meaning that Game Freak/Nintendo are working towards a 2018 release but will push the game back to say 2019 if necessary. 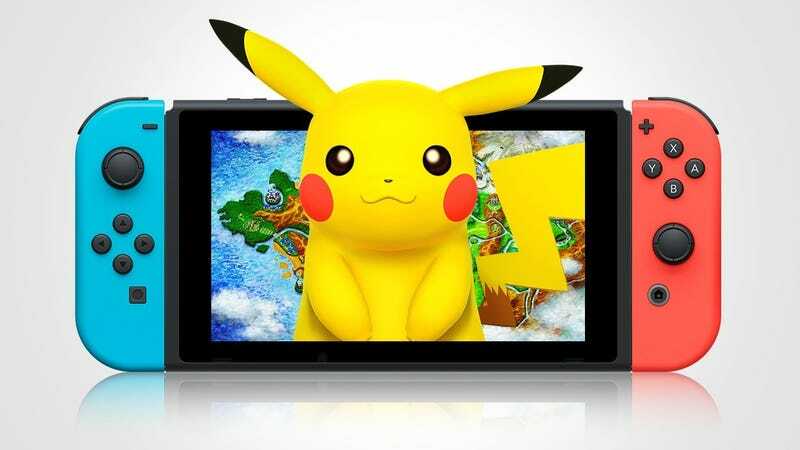 The incoming Switch release is set to shake up the series in a big way, since for the first time in Pokémon’s 20-odd year history gamers will be able to legitimately play Pokémon as a home console release, thanks to the dual functionality of Nintendo’s latest hardware. It will also be the first HD Pokémon RPG, and nobody really knows what to expect. Due to the aforementioned factors, Pokémon rumor season is in full swing as gamers eagerly anticipate the next Pokémon direct. Just about everyone has an enormous wish -list of what they want from the upcoming game, and there are lively discussions that have spilled from the back alleys onto the streets. A given in the buildup to any Pokémon release are “leaks”, someone will appear on a forum somewhere claiming to either be working on the game or to have inside sources and divulge “information” about the games to a ravenous public, some of them going great lengths to be as cryptic or obscure as possible for whatever reason. Usually, they are quite easily debunked, but there is always one or two that hold for a while. This isn’t always the case, and I want to try compile here a list of the most compelling “leaks” to be found this rumor season. This one got me kindof interested. But, the first red flag is that this guy popped up on 4Chan, claiming to be working on localizing the game and having a segment of a script for the early game. He even made a nice infographic containing the details that he had gathered from his supposed work on localizing the aforementioned script. Snake brother legendaries, evil team building a huge city (“Innovation”) and getting all the people that live in towns around the island (“Tradition”) to move there. A Pokémon inspired by the Reclining Buddha statue, an airport and 2 new eeveelutions, rock and flying types. To my knowledge this has yet to be debunked. The timing of this one was obviously suspicious, but it has yet to be debunked. If it is truly a screenie of the new game, a lot of people will be disappointed. To thicken the plot this was posted a few days later on the official Project Eevee twitter account. Coincidence? Unlikely. Hinting? Possibly. I think they are most likely trolling, though, after the supposed leaked image went viral. Reaction to this image has been.. interesting. Most of the reactions are of disappointment, since just about everyone is hoping for Pokémon to get the “Breath of the Wild” treatment. This supposed screenshot is very similar graphically to the most recent 3DS games. Some are saying that it could be an early tech demo, but it’s most likely just fake. To my knowledge, it has not been convincingly debunked as yet. This is an interesting one because these rumors surfaced way back in 2014, describing a new Pokémon that was in the works and that would be released on an as yet unannounced system, and came hot on the heels of the Nintendo Fusion rumors that perhaps described an early version of the Switch. Interestingly, the rumors here are very, very similar to the supposed Italian leaks. Perhaps our leaker dug these old rumors up and used them as a foundation for his own rumor-mongering. Both of these describe a South-East Asian based region, and both describe some similar MMO elements. I’m sure you’ve realized by now that the Switch itself has Plus and Minus buttons, and that this rumour surfaced years before the Switch was announced. I actually liked the blue and red Joy-Cons more after realizing that they invoked Plusle and Minun. Coincidence?? There is a lot of talk in all the rumor mongering about the theme of the games being tradition vs. innovation. I keep hearing that. “New Exploration” could be another way of saying innovation, yes? This is another one doing the rounds. A twitter user who claims to work for Ubisoft claims to have some insider information, and while he hasn’t actually described anything about the game itself, he has posted one very cryptic hint that has gotten people talking. Why are people taking this seriously, you ask? Simply because he claims to work for Ubisoft? Well, part of what has gotten people talking is that Ubisoft actually follows him. Ubisoft who is followed by 7 million + users and only follows around 700. He also seems to know who’s who in the gaming industry. One has to wonder why a Ubisoft employee would know about the inner workings of GameFreak, and people have surmised that this is because of the close relationship the company seems to have with Nintendo as evidenced by the Mario + Rabbids crossover that this dude apparently worked on. I have my reservations about this theory, though - all through Pokémon’s history, the games and the anime have existed in separate continuities. There are quite a lot of cities and locations appearing in the Anime that have never made it into the games, I’m pretty sure this is as many as a few each season. This might go hand-in-hand with the theory that Gen 8 will be a Kanto reboot. The Kanto region in the games, however, had the Sevii Islands, which were only in part analogous to the Orange Islands of the anime, in that they were somehow connected to the Kanto region. The islands in the Anime served as something of a middle ground before Ash reached Johto, and were set as the location for Pokémon The Movie 2000. This is all, of course, pure speculation. I can’t be the only one noticing that Lapras has showed up in many of these rumors. This is a trademark that the Pokémon Company supposedly registered a few days ago - Ultra Shiny. Speculation around this trademark includes the possibility that it could be a new form of Shiny, a Shinier Shiny, that will appear in the new games and hints at an upcoming reveal. Others are saying that it could be related to the TCG, and not at all related to the games. Now, imagine - Shiny hunters having to collect their shinies and do it all over again. That just seems insane. Personally, I think it would be cool to have an even rarer version of a shiny, since I’ve never actively hunted shinies or traded for them, they just don’t seem that special anymore where back in the day it was ultra rare to have even one. The only way to debunk these rumors is, of course, with legitimate information that we will likely only get when the game is officially announced along with a trailer of sorts. It’s fun to speculate, though, right? Personally, I always enjoy the buildup to a new Pokémon game, and the rumors are something of a guilty pleasure for me. My opinion, in all of this, is that we will get an announcement before long unless there is some huge delay in development, and I’m almost willing to bet that this game has been in development almost as long as the Switch has. I think we will get an entirely new region to kick off a new generation, with perhaps a reboot of Kanto following that a few years later. At the very least, for now, the Italian leaks are plausible, or would be if they didn’t seem like a copypasta of the old Plus and Minus rumours. Of course, I use the word leak here very loosely. What do you think of all of this? Do you like speculating, or do you prefer to wait and see? Feel free to leave a comment about what you want from the next Pokémon game, and especially if I’ve missed out on any juicy rumours. I’ll be sure to add them in! I’ll definitely update if anything interesting crops up.